By Alan Green in Uncategorized, VectorVest on 23rd May 2018 . Countryside Properties (CSP.L) is a leading UK homebuilder and regeneration partner specialising in place making and urban regeneration. The business is centred around two complementary divisions, Partnerships and Housebuilding. Partnerships specialises in urban regeneration of public sector land, delivering private and affordable homes by partnering with local authorities and housing associations. The Housebuilding division, operating under Countryside and Millgate brands, develops sites that provide private and affordable housing, on land owned or controlled by the Group. CSP was founded in 1958. It operates in locations across outer London, the South East, the North West of England and the Midlands. A perennial favourite of VectorVest despite a retracement in the share price in late 2017. The recent upward move in the GRT (Earnings Growth Rate) metric flagged up on the VectorVest stock analysis and portfolio management platform in March 2018 and is also clearly indicated on the chart below. The forecast growth in earnings continues all the way through to today’s GRT rating of 25%, which VectorVest considers to be excellent. Although the RS (Relative Safety) metric only registers a fair rating of 1.00 (scale of 0.00 to 2.00), trading at 374p the stock is still way below the current VectorVest valuation of 539p per share. 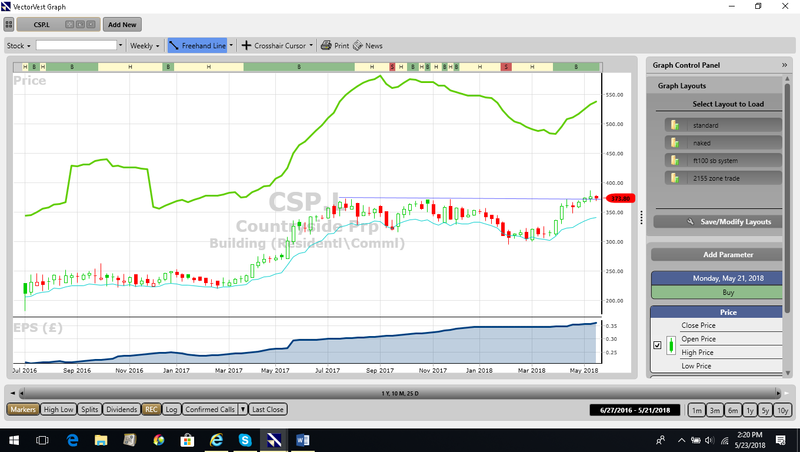 A weekly chart of CSP.L is shown above in my normal format. The share is breaking upwards through a 52-week high and is on a buy recommendation on VectorVest. The technical target should be a repeat of the directional move made in March to July of 2017. This would result in a technical target similar to the current VectorVest valuation. Summary: It is generally accepted that well managed UK property investments are ‘safe as houses’. I have spoken of the virtues of CSP on many occasions, and while the ‘fair’ RS rating may see conservative sector investors look elsewhere, in the view of VectorVest the substantial valuation upside on offer and excellent GRT rating adds up to a compelling investment case for any portfolio. Buy. Readers can examine trading opportunities on PRES and a host of other similar stocks for a single payment of £5.95. This gives access to the VectorVest Risk Free 30-day trial, where members enjoy unlimited access to VectorVest UK & U.S., plus VectorVest University for on-demand strategies and training. Link here to view.